Not being Rebecca MacKinnon has its disadvantages. Yet, in spite of having only the most meager of backgrounds as a paid journalist and not being the most quoted China-internet specialist in the Occident, I have a few views on the subject that have been brewing for a few days. Thus, when you’re done reading MacKinnon’s spot-on essay about how Hillary Clinton ought not to play this situation, the following jottings might be worth your time to read. Surveying a few of the core informational hubs read by a certain strain of Chinese readers — the Huanqiu Shibao, some China.com forums and Xinhua’s English and Chinese sites — it appears pretty obvious that the anti-Google rhetoric in China is getting stronger and that we’ve now reached a point where the CCP has now, for better or worse, turned this whole thing into a “West attempting to bully China” contest. In this “news” story published earlier today in Huanqiu Shibao, Chinese netizens are being asked “to awaken” and readers are regaled to extended quotations from anonymous netizens about “how this isn’t 1840” and the Opium War and how China will not be bullied. Unsurprisingly, these themes don’t tend to play prominently in the English-language translations proffered by Xinhua. There are also almost 10,000 comments at the bottom of the Huanqiu’s big page for Google news which went up last week. Against such a tide, it might be best to, as Seattle analyst Wendy Liu suggests, find a way to talk about the situation in a way that accepts Mao Zedong’s baseline for public discourse. In addition to a kind of defensive nationalism emerging in the Google stories, a few selective buttons of anti-foreign nationalism are otherwise being pushed right now in the Chinese media. For example, Huanqiu Shibao today runs a series of photographs of the “great anti-American wave of the Japanese people” in 1960. Now, I’m a complete sucker for data detailing opposition to the U.S.-Japan Security Treaty of that year, and the photos are interesting because they remind me how the Chinese government suddenly becomes very friendly to Japan when hostility is expressed in the archipelago towards the U.S. Highlighting these photos on the front page of the (internet version) of the Huanqiu has a serious and important commemorative function on an actual anniversary, to be sure, but it is also meant to both soften views of Japan while implying that both Chinese and Japanese netizens can unite in their opposition to the imposition of “U.S. hegemony” in East Asia. One other, more significant, angle to consider is the domestic politics equation and the ever-present (yet rarely-visible) struggle for position within the Chinese Communist Party. We already know full well that Hu Jintao is a rather conservative leader who, since his campaigns of the 1980s to clean up the spread of “spritual pollution” among youth, has never been disposed to extend the boundaries of public discourse in a fashion that might imperil CCP monopolies. 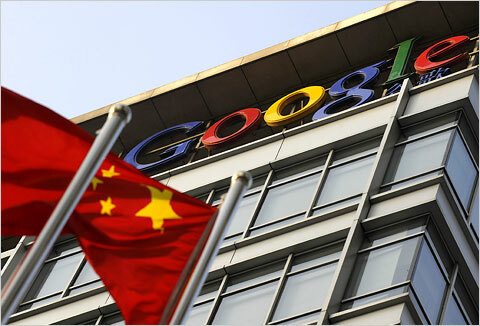 It hardly seems likely that he, or Xi Jinping, the probable successor, would wish to lose ground on the Google issue or in any way be seen as reforming at the behest of foreign powers. Again, Rebecca MacKinnon’s essay may come in handy. Finally, Danwei.org runs an important translation of the first Huanqiu Shibao front-page article to have appeared on the Google story. If you consider yourself informed about how China interacts with the world, or if you simply wish to revel in how opaque is the current state of Chinese journalism, do read it! I think it is safe to conclude that what ticked many (even some pro-Google netizens) off was the fact that the US government hastily acted on behalf of Google by demanding an official explanation and summoning Chinese embassy officials. Certainly Hillary Clinton’s “in-your-face” gesture did not help. Had the US government not jumped into the fray and consequently given people the impression that Google’s move was closely coordinated with the US government (who knows what they are up to? ), more people would have been more sympathetic toward Google, I believe. Now Google has back-peddled out of its threat to exit China completely just as I predicted. I hope they don’t make a fool out of themselves by not getting any compromise from the Chinese government.